I've been looking for a new notebook recently as my old one needed replacement and I wanted to step up to something just a tad bit faster. As I use a notebook on a daily basis, either on the road or at my desk, it needs to be as well-rounded as possible. For starters I want a full size keyboard, built in DVDRW drive to not cut into my productivity much as I have to scramble to go find the external optical drive many smaller notebooks are featured with. Furthermore wide-screen TFT's with >1280 x 1024 resolution makes for the fonts and icons to be rather small on a 14" or 15" screen hence I'll settle for the defacto 1024x768 resolution with a screen size of 14" or larger. What else? Well, I can't be bothered with all sort of extra multimedia keys placed in odd locations, chrome or matte silver lining, fancy lights or anything else that's just there to up the notebook's visual appeal and not its functionality. So basically I'm looking for a notebook that clearly puts function over form and not vice-versa. But it doesn't stop there, I also want a notebook that's certified for Microsoft Windows XP and thus, for example, will not rely on 3rd party drivers to have the majority of features unlocked and working properly after a reinstall. The notebook has to have good, properly documented and frequently updated online support from the manufacturer in terms of new firmware releases, bug fixes, new drivers and other information that concerns the notebook. And last but not least it needs to be durable, scratch resistant and able to survive in an office environment where it'll be used for almost 8-hours a day on a daily basis. That firmly puts my requirements in the business notebook category as those are usually able to offer all of the above whereas consumer notebooks don't. HP's nc6120 Centrino notebook, a well-rounded business companion. That narrowed down my choices for a new notebook to just a few manufacturers that make business notebooks; I'd have to go shopping with IBM, HP/Compaq, Toshiba, Dell or NEC. Despite the broad selection it was hard to find a notebook that would fit my requirements, IBM's notebooks for example lacked a FireWire connector or media-card reader which were both a must have for me as I often use these. I finally settled on one of HP's new business notebooks that boosts a number of appealing features such as an integrated memory-card reader, DVDRW drive with dual-layer capability, a 15" screen, molded laminate construction for optimal resistance against wear and tear and all the connectivity you’ll need, including a serial port, that's now very uncommon on most notebooks. Adding to that the fact that it was priced lower as many of the others (that lacked some of the required features) I ordered a HP nc6120 Centrino notebook with a 1.73GHz Pentium M processor, 512MB of memory, a 15" screen and a DVDRW dual layer optical drive. Built in FireWire connectivity to interface with high-speed devices such as MiniDV cameras. It has been well over a month now since I first started using it and thus I feel confident enough to report on my findings. Did the notebook indeed live up to my expectations? To start off with let me comment on how it arrived here. 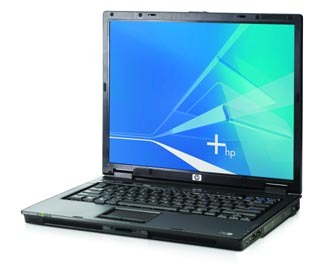 It came with a minimum software package installed, just Windows XP Pro, all the needed drivers and a few tools from HP, not the usual bloated software package that bogs the notebook down as found on most consumer models, a plus in my book. But how about performance? Well, performance is fast enough for all of my daily office tasks, I don't really have the need to install more memory or opt for a faster processor. But in all honesty I'm not the kind of user that has lots of windows open or runs a host of other processes in the background. The 15" screen is nice and clear but could be a bit brighter and the colors are all wrong, but that was simply fixed by using Pantone ColorVision’s Spyder 2 calibration tool to create a custom color profile (more on that in an upcoming article), so that was just a minor annoyance. The HP nc6120's keyboard, full size and with just the basic function keys. What I did find distracting at times was the fan noise, because even when used in battery mode, with the processor running at a mere 366MHz, it would spin up audibly. My previous notebooks have all had fans that were inaudible or wouldn't even turn on when running on batteries, but I do have a fairly quiet office, hence your mileage may vary. Battery life is on average 3.5-hours of normal use, which is right in line with similar Centrino notebooks. Unfortunately a spare battery is sold at the usual ridiculous aftermarkt price, else I'd opt for a 2nd battery as a backup when I'm traveling. One thing got me a bit puzzled though, the HP nc6120 features a docking station connector at the bottom which has its contacts unprotected by a plastic lid, hence beware that no paperclips or other metal objects are under the notebook when you put it down, as who knows what might happen. I would've welcomed a rubber gasket or some plastic lid to protect the connector from such mishaps. Other than the points mentioned above I've not found any obvious shortcomings or flaws with this notebook. The design is sleek, light and compact as well as functional. Performance is plentiful for all normal office tasks, fan-noise is tolerable and the screen is nice and clear and only needs an updated color profile for those that work with photos and video on a regular basis and want a lifelike representation. If you're looking for a feature-packed notebook aimed at the demanding business user then I'd certainly give the HP nc6120 a look, it has all the connectivity and features to make it a great office companion.